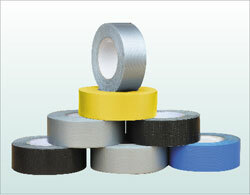 Cloth Duct Tape is a polyethylene-coated cloth and coated with a high tack rubber adhesive. Its great application includes taping of metal ductwork, hanging of poly sheeting, binding books, bundling wires, color coding, packaging cartons and pluming. It has high tack, good adhesion and super holding power characteristics.